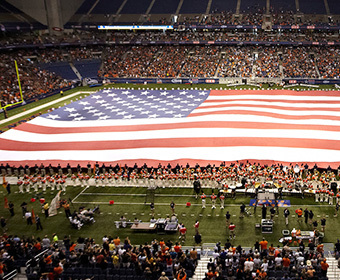 (Aug. 13, 2018) -- UTSA Athletics has launched “Operation Defend the Dome” for the football team’s home opener against Baylor on Saturday, Sept. 8, at the Alamodome to recognize and show appreciation to those who defend our country. For every ticket purchased between Aug. 13 and Sept. 7, UTSA Athletics will donate the same number of tickets to San Antonio active-duty and veteran military members and their immediate family members. To help achieve the goal of defending the dome in “Military City USA,” fans and local businesses also are encouraged to purchase tickets at $5 to donate. They can call or text 210-458-UTSA (8872) for more information. View the 2018 UTSA Football schedule.